If you have been following this Dreamworks series you probably recall I have the unpopular opinion of disliking the original Shrek movie. It’s basically a parody film and once I’ve heard the jokes they aren’t as funny to me on the rewatch. Aside from laughs the movie doesn’t have much going for it artistically or character-wise. So, what would I think about the sequel, Shrek 2? I still have some issues but it is a significant step up from the original (as Dreamworks tends to do. Their sequels are oddly often better than originals). 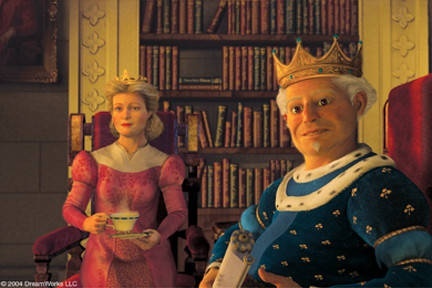 Shrek 2 actually tells a creative story and doesn’t just make fun of the fairytale genre but subverts it in some clever ways. To get things started, I probably have a different take on the introduction of the film than most. We get a musical montage that pokes fun at Spider-man, Little Mermaid, From Here to Eternity, Matrix, Lord of the Rings and more. These type of parody jokes where they mimic a scene from another film just aren’t funny to me. So, needless to say this movie gets off to a bad start. However, it pretty quickly starts the story of Fiona taking Shrek to meet her parents who are sovereigns over the land of Far Far Away. 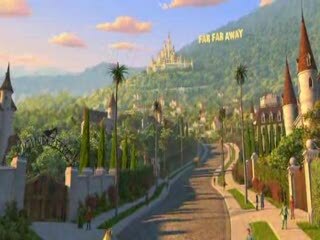 I like that the kingdom is basically Hollywood and that Fairy Godmother is like a magical Oprah. These gags are funny because they actually have something to do with the narrative and aren’t just mimicking something we know and love for a joke. 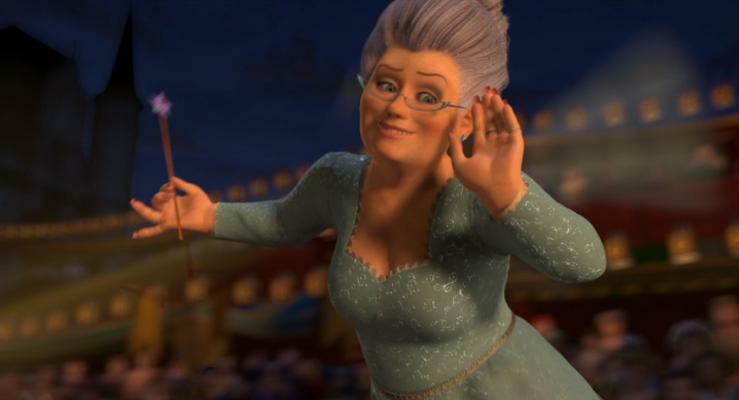 Jennifer Saunders does terrific voice work as the Fairy Godmother and she is an entertaining villain- especially because we know the Fairy Godmother as a sweet rescuer in most stories. I particularly like the scene when she first appears to Fioana and sings a manic version of Bibbidi Bobbidi Boo. 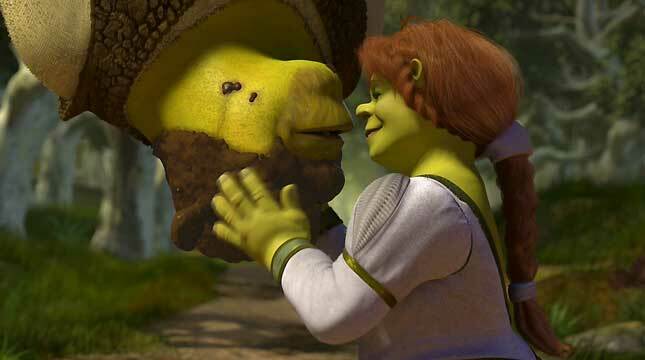 The marriage dynamic between Fiona and Shrek is pretty well done. I like the idea of how much should you change to accommodate the person you love? It’s an interesting question and they explore it pretty well. I still wish Cameron Diaz was a better voice actor for Fiona but at least her dialogue is better than in the first film. The other fantastic addition to the cast is Antonio Banderas as Puss in Boots. Talk about perfect casting! He is funny. He is sweet. He is a swashbuckling knave. Also because he famously played Zorro it is easy to bring that persona to the role when you hear his voice. 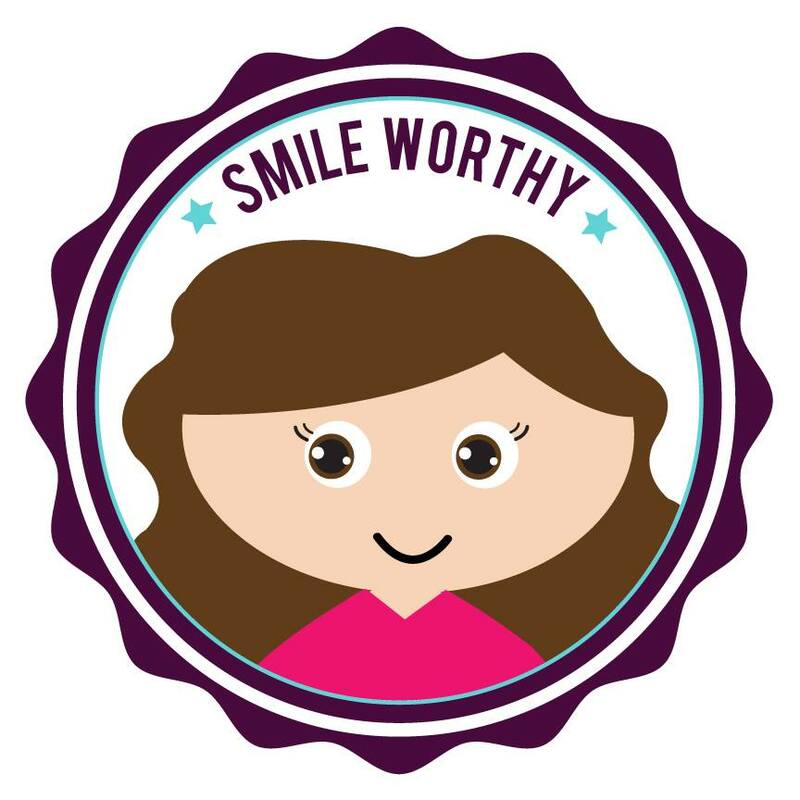 It is an example of celebrity voice acting paying off and adding more to the character. Shrek is pretty unlikable in this movie, spending most of the time sulking and growling, about everything that happens. His saving grace is when he gets turned into a human and has to do some introspection on who he is and what he wants out of life. The plot-line with Fiona’s parents and her father secretly being the Frog Prince feels a little on the nose to me. The voice acting by Julie Andrews and John Cleese is good but all the dialogue about accepting their daughter when she is ‘one of them’ can be more than a bit heavy handed. However, let’s face it the Shrek movies aren’t exactly known for their nuance and subtlety. I also think Donkey feels a bit extraneous to me. He really isn’t needed for the story and so they end up working him in awkward ways. It makes the character more annoying than affecting when all he is there for is occasional commentary. It also doesn’t help that Puss in Boots is so much better than Donkey as a sidekick. The pop music soundtrack also feels dated and doesn’t fit well with the story. Overall Shrek 2 mostly works. It introduces 2 great new characters in Fairy Godmother and Puss in Boots. It actually tells a story and tries to give the characters dimension and heart. The animation is definitely a step up from the original and most of the voice acting is solid. I still don’t like the parody jokes, an unlikable Shrek and the Frog Prince story-line but the good outweigh the bad and I enjoyed watching it. Haven’t gotten to this one yet, so I gotta see what I’ll think of it on the rewatch. 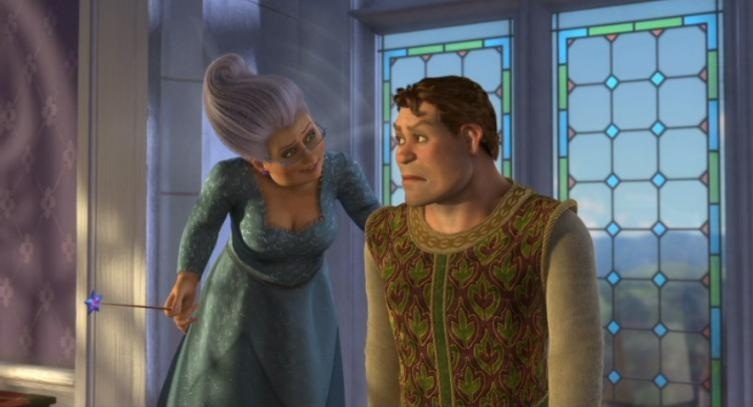 Shrek 2 does have its issues, and does start the trends of sequelitis, but it’s still a joy. Even this film doesnt age well though, like all the other Shrek films. I have extremely fond memories of Shrek 2. My mom picked me up from school one day and without warning drove us to the movie theater to see this, and I loved it. 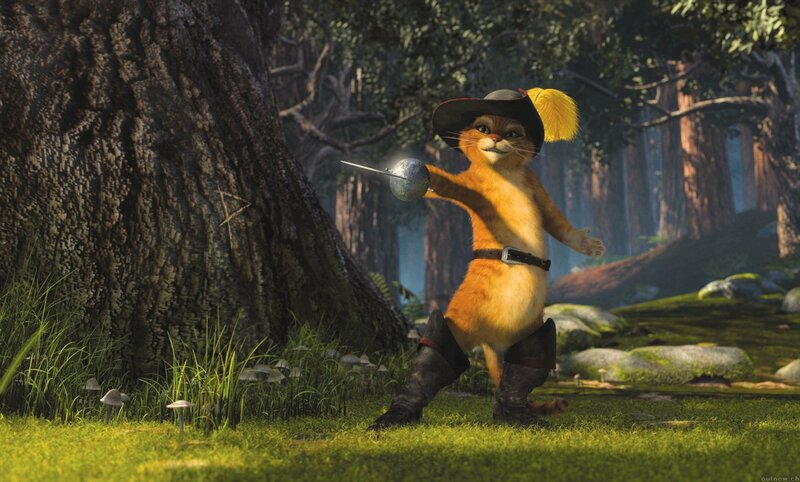 I love Puss in Boots, the Hollywood gags, and especially the siege set to “I Need a Hero.” It may be my nostalgia goggles, but this is probably my favorite DreamWorks sequel.